Construction of the brand new stadium in Nice lasted almost exactly 2 years, just slightly behind the 22-month earlier estimates. 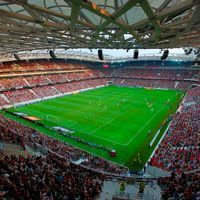 The project was launched ahead of Euro 2016 and capacity was divided into three tiers in order to allow for best capacity and demand – closing upper ring if no need remains for its operation. The stadium is located at the very western outskirts of Nice, contrary to centrally-located Stade du Ray, its predecessor. In return the ground is just off the main regional highway hub. Designed by Willmotte et Associees, it reached a high level of interest due to its aesthetics. The outer shell is translucent and light, while roof's photovoltaic panels and wood used in part of the structure earned it its initial name of Nice Eco Stadium upon groundbreaking. Eventually, though, naming rights were bought for at least 9 years by Allianz. Opening game was held on Sept 22 2013 against FC Valenciennes. The match ended with an impressive 4:0 victory, still remaining the attendance record with over 34,450 people in attendance. The stadium of northern Dunkerque was inaugurated first in 1930, but then destroyed during WWII. First stand, main one, was rebuilt by 1958, while its opposite-side equivalent returned in 1960. With land embankments extending the two concrete structures capacity grew to roughly 12,000, filled to capacity mostly during northern derbies with Lille or Lens. Later a vast decrease in capacity came, though, due to seat installation and regulation changes. The multi-use stadium in Sain-Avold, small town near the German border and just east of Metz, is the town's main sports venue. It has one concrete stand with a steep seating layout and large roof. The stand accommodates minority of its 3,000-capacity, while most fans need to stand around the 3-lane running track. The stadium has floodlights, but not sufficient to provide for a TV broadcast.